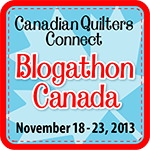 A few weeks ago, Carol of Sew Sisters Quilt Shop contacted me and asked if I'd be willing to be part of the line up for this year's Blogathon Canada. And of course, I said yes! I was super excited. What is the Blogathon Canada you might ask? This year, Sew Sisters has teamed up with Aurifil, Northcott and Robert Kaufman to bring you even more fantastic giveaways! Check out their blog for more and see how you can join the party! Go to Sew Sisters Quilt Shop. As you can see, my date will be November 22 and I'll be representing Quebec. 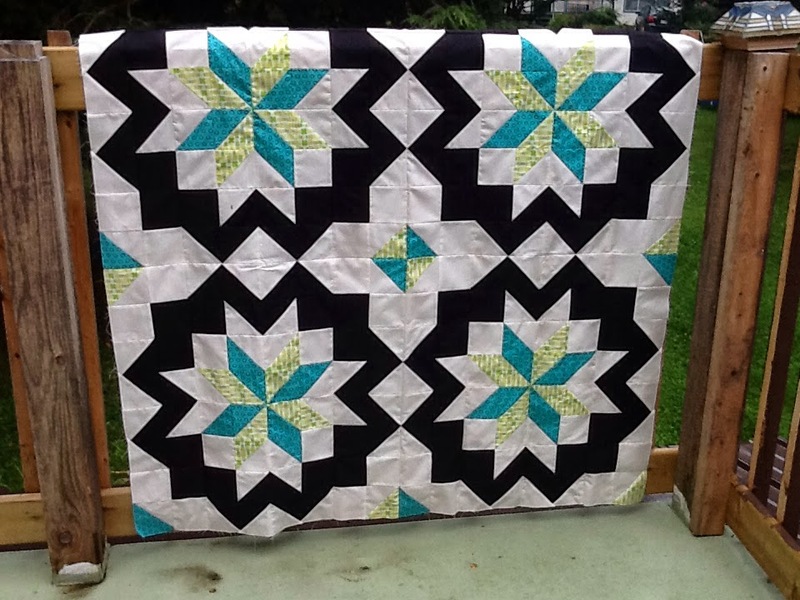 Make sure you visit the Sew Sisters Quilt Shop blog for more information. 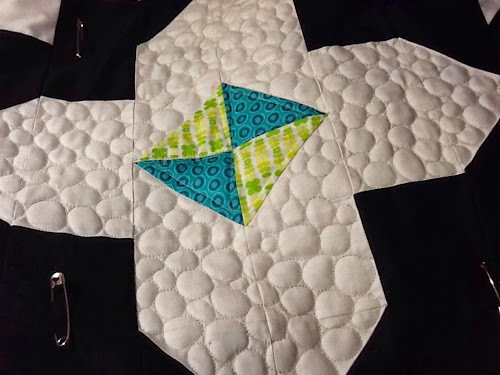 Oh - and if you are a Canadian quilter and blogger who lives in Quebec, send me your blog address so I can add you to the list! Star Surround - It's done! It's night time here and I just couldn't wait until morning to take pictures... So they are a little dark. 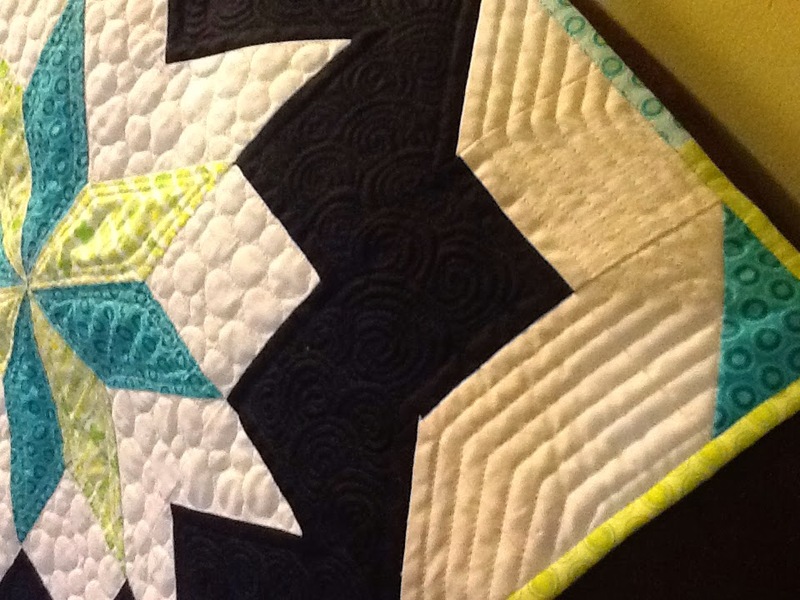 The quilting took many, many hours. In part because I am still a beginner at this FMQ thing so I go pretty slow, but also in part because my poor little body doesn't like long quilting sessions. Lots and lots of pebbling. And some straight lines with the walking foot. Before I go, I thought I'd let you know that Craftsy is having a sale right now and until midnight tomorrow. Check it out! 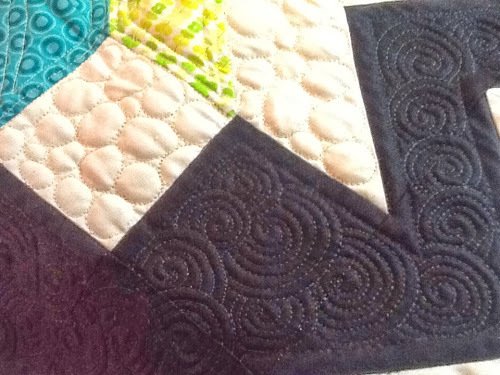 The lime/blue pieces are quilted with some dot-to-dot motifs (which I learned in Angela Walters' latest Craftsy class). And that's how far I got. 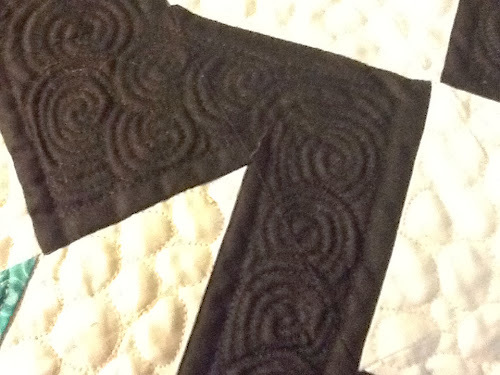 I have a little bit of the pebbling left to do and then I can move on to the binding and the label. 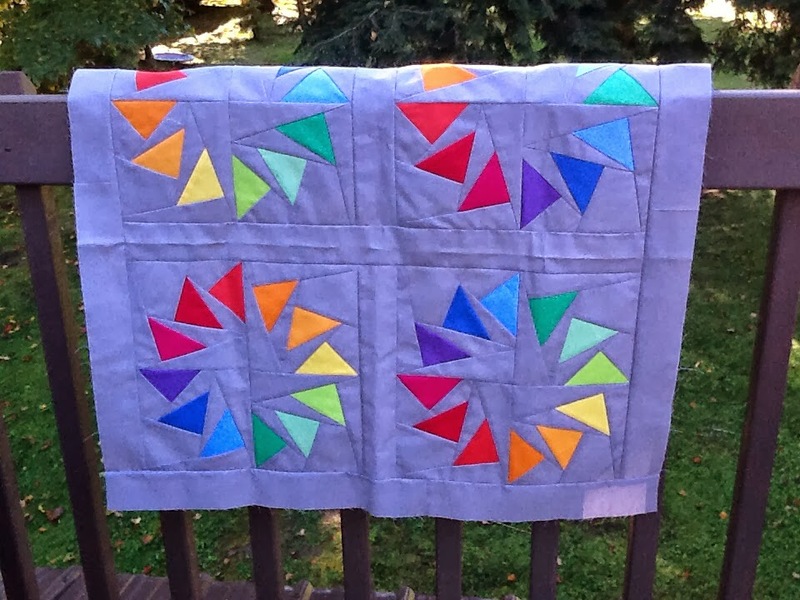 I hope to have this quilt done for the next Montreal Modern Quilt Guild meeting at the beginning of November. Unfortunately, I haven't done a lot of sewing lately. My work days are just so crazy busy that when I finally make it home, I just want to sit on the couch, watch hockey games and snack on totally unhealthy foods. As a result, I'm super stressed, I'm losing my voice (too much screaming at the TV while watching the games) and I've gained 5 lbs in the last week. Not good at all! Last night though, I decide to drag my sorry behind to the basement and sit at my sewing machine. And I worked on Clover, this month's Schnibble project. I didn't get very far, but any progress is good these days. I'm using PB&J to make Clover. I had 2 charm packs and when I saw Carrie's version, I knew I had to use them. In other news, I attended the Montreal Modern Quilt Guild sew-in over the weekend (my very first one!) 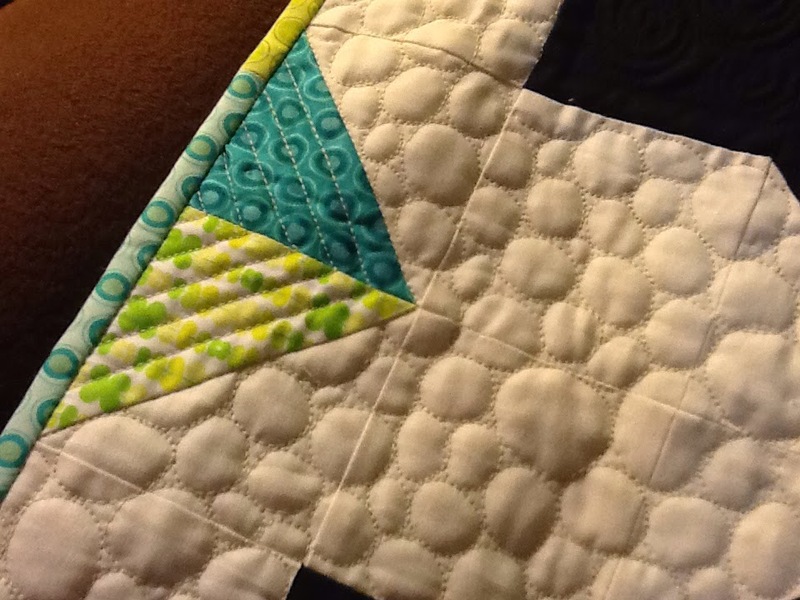 and demonstrated the Scrappy Trip Around The World quilt block. We are organizing a block lottery for the November meeting so I made 4 blocks. Up here in Canada, we have Thanksgiving weekend coming up, so with any luck, I'll be getting some serious sewing time. It's once again time for me to commit to a monthly goal. The one finish I will focus on in October. 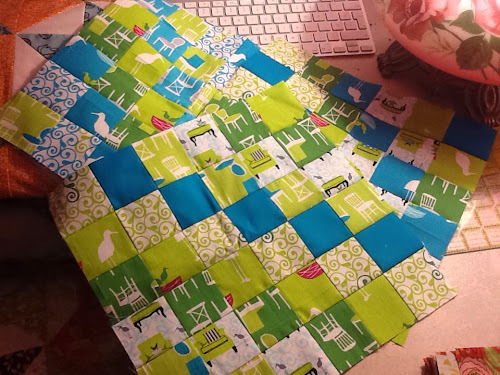 I already started quilting it (you can see a picture of my progress here) so I'm pretty confident I can do this! 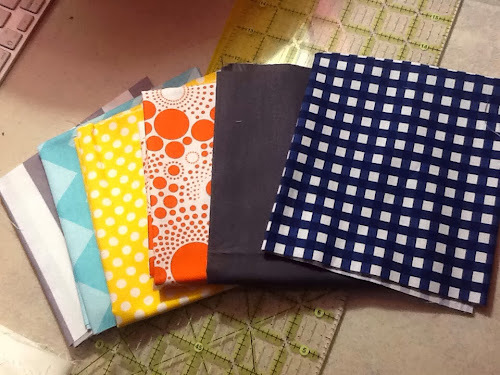 Linking up at Fiber of all Sorts and Sew Bittersweet Designs for ALYOF (see the button in my sidebar). Go ahead and do the same! I managed to resist getting started on a new project and instead focused on my WIPs for the past week or so. 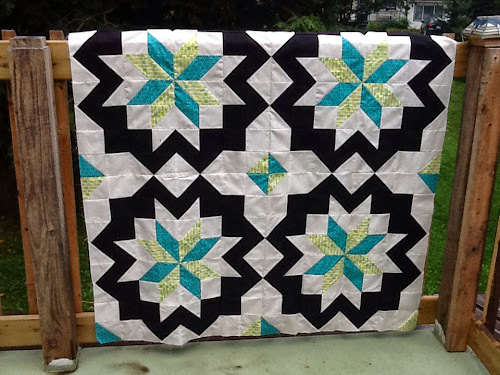 You know as well as I do that sometimes, that in itself is quite the feat given all the gorgeous quilts everywhere in blogland. I will be linking up at Lee's for WIP Wednesday, so here is what I've been working on lately. First, I finished my granny squares quilt. To read the Ta Da post and get all the details (and pictures), click here. Second, I finished piecing my Flying Geese top. The picture isn't great - the colours really pop in real life. It measures about 30" squares and will look fabulous on my sewing room wall once it's all quilted. I have a bunch of ideas floating around in my head for the quilting of this one and I cannot wait to get started. 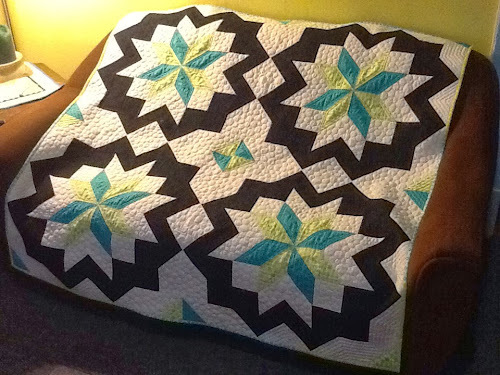 But, my Flying Geese will have to wait until it can be quilted. Right now, I've got my Star Surround on the sewing machine in the country (which is the machine i use for FMQ). 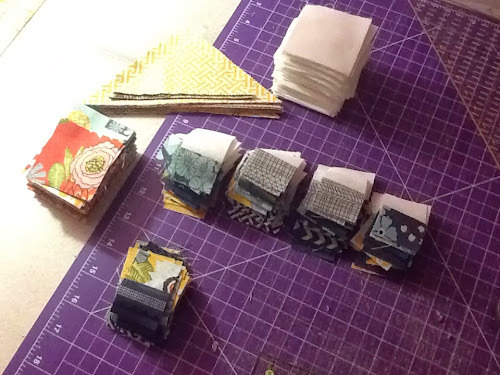 I've also been working on small things for the next meeting of the Montreal Modern Quilt Guild. Will post pictures as soon as they are done. And what have you been up to this week? 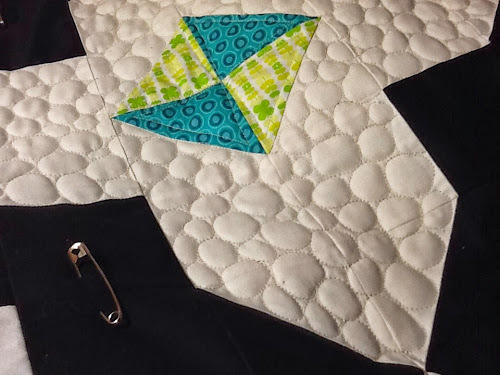 If you need inspiration, click on the WIP Wednesday button in my sidebar and check put what people are working on this week.